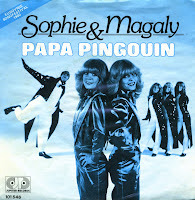 The twin sisters Sophie and Magaly Gilles represented Luxembourg during the 1980 Eurovision Song Contest with the song 'Papa Pingouin'. It is often cited as an example of the strange and naff nature of the Song Contest, because the song was performed with three backing singers dressed in black and white and a man in a penguin costume. The song was written by the prolific duo Ralph Siegel and Bernd Meinunger, who are normally associated with Germany as a composer-lyricist combination. When original singers Sophie & Magaly signed with Ralph Siegel, they were still minors and their parents were quite ignorant of business dealings in showbiz. A contract was signed between Ralph Siegel and the parents, giving only a very small percentage of the sales to the sisters. They later reported that each of the sisters only got the equivalent of 5000 euros, while more than one million singles wer sold. Things didn't end well for the two: Magaly contracted HIV in the late Eighties and died of AIDS in April 1996. Sophie suffers from depressions and now lives in the south of France.